America's almost forgotten master -- too little noticed during his lifetime, too little noticed today. I saw his work for the first time on my first extended visit to New York in 1968 at a huge Gottlieb double retrospective at both the Guggenheim and Whitney. The show was overwhelming -- I can't recall a more extensive retrospective exhibition of a living artist. Yet it made curiously little impact. I remember a tour guide explaining before a masterpiece that Franz Kline was the better painter -- there's never been a Gottlieb myth. 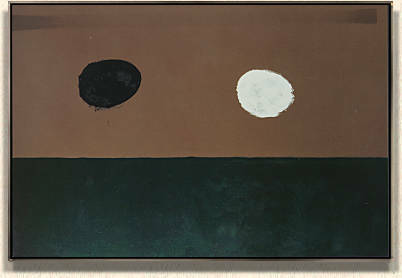 Gottlieb painted great pictures from the early '40s until his death in 1974. Unlike Pollock (who faded) and Rothko who began with academic surrealism in the '40s and stiffened into self-parody followed by terminal blandness in the '60s and '70s. Gottlieb was never consistent, but he never declined. His Pictographs from the '40s found something new in Klee, moving it successfully to the scale of easel painting, something that Klee himself could never do (Klee was confined to portfolio scale, the drawing, the piece brève.) In addition to their more generous scale, Gottlieb's Pictographs conveyed menace more effectively than any other artists I can think of. It's curious that this fact alone hasn't brought about a revival of his art among the post-mods. Even Picasso couldn't match him in this. 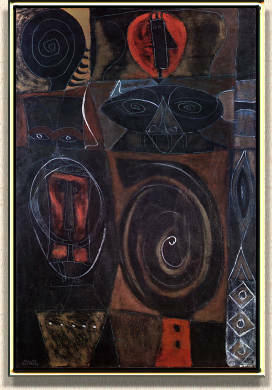 MASQUERADE, 1945. Oil and egg tempera on canvas, 36 x 24 in. In the later '50s he was one of the few artists of his generation to move successfully to a larger and even monumental scale and maintained this to the end. In this he may have been helped because his Imaginary Landscapes from the early '50s, which presented an intermediary step to the Burst format which became his signature motif the '60s and '70s. The Whitney exhibition that I saw showed recent Bursts, many of them very large and impressive -- not just in their handling and placement but in their color, at which Gottlieb proved himself a master rare in his generation. This was compromised at times by a strong graphic sensibility, as if Rothko were combining with Motherwell or de Kooning: the black splatter, the black, biting burst sometimes distracted from the overall ambiance, as if the painting existed in separate registers. But when the graphic was subsumed into the color, the result was high art. 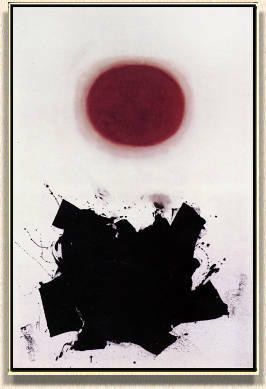 (Curiously, Gottlieb was a master graphic artist, but in black and white his paintings seldom achieved the completeness of Motherwell -- his paintings yearned for resonant colour.) He may well have been the master painter of his generation: he could lay on paint in more different ways than anyone. Added to this was an uncanny gift for placement, for a newly spacious placement within the picture rectangle as well for the intervals between shapes -- none of it predictable and never simply "good design." I met Gottlieb just once in 1970, offering to organize an exhibition of pictographs on paper for the MacKenzie Gallery in Regina. He was businesslike, but clearly didn't want to root back through his earlier work. When he indicated that he'd been painting acrylics on paper I pursued the suggestion and had the opportunity of a first look through a number of works recently done, from which I selected about 30 for a small exhibition. Three of his comments at the time struck me. Upon showing an attempted Pictograph that hadn't come off, he observed something like, "You can't go back." When I admired a Burst with a peculiar mottled ground he commented: "I'll have to do that on a large scale. I'll have my assistants paint a background like that" When I left he remarked, of Pop Art, that "what used to be commercial artists now think of themselves as fine artists." JAGGED, 1960. Oil on canvas, 72 x 48 in. He wrote me a note of thanks after the exhibition, but I couldn't get hold of him when I next went to New York. I found later that he'd suffered a stroke in 1971 which left his left side paralyzed. He subsequently painted from a wheelchair, presumably helped by studio assistants (as had Renoir made his late sculpture) perhaps down to the very "touch," for his last paintings were often very large. They were supremely good: among the greatest "Gottliebs" and some of the great paintings of the era. Unlike many of his generation, he concluded on a very high note. ECHO, 1972. Acrylic and enamel on linen, 60 x 90 in.